Hogan signed a reserve/future contract with the Colts on Sunday. Analysis: Hogan appeared in two games for the Colts in 2017, but he spent most of the 2018 campaign on either injured reserve or the practice squad. He'll now have an offseason to compete for a reserve role at wideout behind T.Y. Hilton and others. The Colts signed Hogan to their practice squad Friday. 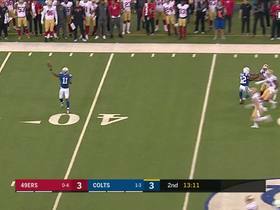 Analysis: Indianapolis released fellow wideout K.J. Brent to clear room on the practice squad for Hogan. The 23-year-old, who had previously been cut loose by Indianapolis in early September, will look to impress in practices and make a case for a spot on the 53-man roster. The Colts waived Hogan (undisclosed) from injured reserve Saturday, Andrew Walker of the Colts' official site reports. Analysis: Once Hogan recovers from his mystery injury, he'll be able to sign with another squad. 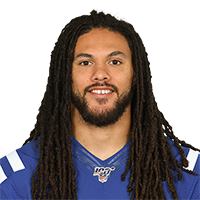 The 23-year-old played two games for the Colts last season and totaled 24 snaps between defense and special teams. Hogan (undisclosed) cleared waivers and reverted to injured reserve, according to the league's official transaction log. Analysis: Hogan dealt with a foot injury for most of the summer and is now stuck on IR through the end of the league year, barring an injury settlement. Hogan (foot) returned to practice Wednesday, Mike Chappell of Fox 59 News Indianapolis reports. Analysis: Hogan has been nursing a foot injury for quite some time now. After missing the team's second preseason contest, Hogan will look to make up for lost time in hopes of earning a roster spot. As of right now, Hogan seems to be on the outside looking in barring an impressive close to camp. Hogan (foot) was ruled out for Monday's preseason game against Baltimore. Analysis: Hogan was sporting a boot at practice Friday, so it's not exactly surprising to see him unavailable for Monday's game. It's unclear how severe the injury is, but the 23-year-old can ill afford to be sidelined for long if he's going to push for a roster spot. Hogan (foot) did not practice Friday and was sporting a boot on his right foot, George Bremer of The Anderson Herald Bulletin reports. Analysis: Hogan played eight snaps in last Thursday's preseason opener, but he apparently was dealing with an ankle injury during a red-zone drill Thursday. He still has a few days to get ready for Monday's preseason game against the Ravens, but the boot makes that seem an unlikely scenario. Hogan didn't practice Friday due to an undisclosed injury, Andrew Walker of the Colts' official site reports. Analysis: Hogan tore his ACL in October of last year, but he hadn't missed any training camp time due to the injury. It's unclear if he's just getting a day off to rest his knee, or if he suffered a different injury. He could be back soon, but he's without a clear return timetable at the moment. Hogan (knee) has been cleared to participate in training camp, Kevin Bowen of ESPN reports. Analysis: Hogan tore his ACL last September. Now nearly 10 months removed from the injury, he's approaching full recovery. While the team may limit his reps slightly to avoid overworking him early in camp, he's considered cleared to play. As it stands he'll have to earn a depth role at wideout to make the 53-man roster, competing against James Wright, K.J. Brent and Deon Cain for the final spots. General manager Chris Ballard said Hogan (knee) is on schedule in his recovery from a torn ACL, Dave Griffiths of CBS 4 Indianapolis reports. Analysis: Hogan originally injured his knee in October of last season and spent the remainder of the 2017 campaign on injured reserve. Now nine months removed from surgery, Hogan is likely nearing a return to the field, though Ballard indicated that the team isn't in a rush to hurry Hogan back into action.